Interstate 794 is a short freeway spur connecting the Marquette Interchange at Interstates 94 and 43 in Downtown Milwaukee with the Milwaukee Bayfront and Jones Island on Lake Michigan. I-794 extends the East West Freeway from I-94 to the Lake Freeway, which runs south along Milwaukee Bay to the Daniel Hoan Bridge. A tied arch span, the Hoan Bridge crosses the Milwaukee River Inlet and carries I-794 south onto Jones Island and the Port of Milwaukee. South of the Carferry Drive interchange (Exit 3), the Lake Freeway transitions into Wisconsin 794 (Lake Parkway). Lake Parkway extends the route southward as a controlled access highway through St. Francis to Pennsylvania Avenue in Cudahy. The parkway section travels below grade south of the tunnels at St. Francis Avenue, while the Interstate portion is entirely elevated. The Hoan Bridge Project commenced in October 2013. It involved the reconstruction of Interstate 794 from the Milwaukee River at Downtown south to Jones Island. The first stage, from late 2013 to late 2014, affected all of east and southbound with the removal and replacement of bridges, concrete overlay and surface repair and redecking of the Hoan Bridge. Northbound work (stages 2A and 2B) ran from the end of 2014 to December 2015. Interstate 794 opened initially as a spur from the Marquette Interchange to Plankinton Avenue (Exit 1D) in 1968. A short extension followed in 1969 to Jackson Street (Exit 1E).1 The Lake Interchange, where I-794 turns from east-west to north-south, was constructed with elements for the unbuilt Lake Freeway north to the Park Freeway. The East West Freeway defaulted traffic to 6th Street until 1969, when the Marquette Interchange was completed. 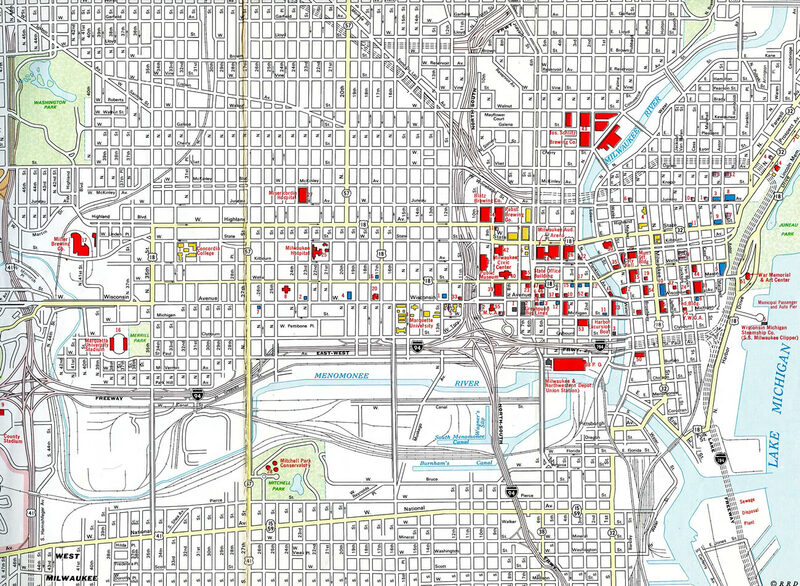 The Lake Freeway, along with the Park Freeway west from Juneau Park, was proposed to form an urban loop encircling Downtown Milwaukee. Only a short stretch of the Park Freeway was built, a spur leading east from the North South Freeway to Jefferson Street, while the Lake Freeway was unconstructed north of I-794. Crossing over the Milwaukee River inlet along the crest of the Hoan Bridge on I-794 south. Photo taken 09/02/05. The Hoan Bridge totals 10,032 feet in length. Interstate 794 turns south and immediately gains elevation as it prepares to cross the Hoan Bridge. The Hoan Bridge made the news on December 13, 2000, when a section of the bridge approach buckled four feet. Fortunately no one was injured. The bridge was relatively new in terms of anticipated bridge life span (having been completed in 1972). During the emergency closure of the span, the affected segment was replaced. The bridge fully reopened on November 1, 2001. Please visit Chris Bessert’s Hoan Bridge web page for more information and details on this near-tragedy. Photo taken 09/02/05. A later proposal by Mayor Norquist in 2003 suggested extending I-794 west to the Zoo Interchange as part of a plan to reroute I-94 away from the Marquette Interchange prior to its reconstruction. Read more about that on the I-894 guide. Interstate 794 veers west at the Lake Interchange and quickly encounters a left-hand ramp (Exit 1E) for Milwaukee Street. Only a half mile remains before the Marquette Interchange ramps to Interstates 41 and 94. Photo taken by Peter Johnson (02/07/16). Progressing westward, Interstate 794 spans the Milwaukee River on the quarter mile approach to the Marquette Interchange (Exits 1A/B/C). Photo taken by Peter Johnson (02/07/16). Interstate 94 overtakes the East West Freeway en route to Elm Grove, Brookfield and Madison. Photo taken by Peter Johnson (02/07/16). An on-ramp ties into the departing Exits 1B/C from 2nd and Clybourn Streets. U.S. 41 previously overlapped with I-94 west to the Stadium Interchange and south to the Airport Interchange. The concurrency was removed when Interstate 41 was signed in place of U.S. 41 along I-894 in 2015. Photo taken 05/30/11. Flyovers shuttle motorists from I-794 west to the North South Freeway. Interstates 43 & 94 travel south from I-794 to the Airport Interchange, where I-43 turns west along side I-41 & 894 to Greenfield. Photo taken 05/30/11. An end shield for I-794 precedes the on-ramp from 11th and Tory Hill Streets ahead of the flyover carrying I-94 west from the North South Freeway. Photo taken 05/09/10. These signs were replaced as part of the Hoan Bridge Project in 2015. Merging from the right was the two-lane ramp from Lincoln Memorial Drive by the eastern terminus of U.S. 18. The Milwaukee Lakefront Gateway Project replaced this ramp with a new ramp tieing in from an extension of Lincoln Memorial Drive to the south. Photo taken 05/09/10. This diagrammatic sign was added as part of the Marquette Interchange project completed in December 2008. It was replaced during reconstruction of the I-794 viaduct between Milwaukee Street (STH-32) and the Milwaukee River in 2014. Photo taken 05/30/11. Prior to the upgrade of the Marquette Interchange, a left-hand ramp (Exit 1B) connected I-794 west with Interstates 43 south & 94 east toward the airport. Photo taken 09/02/05. Two of these signs were replaced in 2015 to reflect the relocation of U.S. 41 away from the Marquette Interchange. U.S. 41 is now Interstate 41 running along the Airport and Zoo Freeways (Interstate 894). Photo taken 05/30/11. Travelers headed to Interstate 43 (North South Freeway) north also utilized a left-hand ramp (Exit 1C) from Interstate 794 west. Most movements at the Marquette Interchange were originally left-hand ramps, which was part of why the junction was redesigned. Photo taken 09/02/05. An end shield was posted for Interstate 794 west ahead of the East West Freeway transition to Interstate 94. This view looks at a state-named assembly which was removed by 2005. Photo taken by Marc Welby (07/03/00). The left-hand lane defaulted onto Exit 1B while the number two lane was an optional lane for both Exit 1C and 1A. Construction to upgrade the Marquette Interchange took place between 2005 and 2008. Photo taken 09/02/05. A lengthy collector distributor roadway system accompanies Interstates 43 & 94 between the Lincoln and Greenfield Avenue overpasses. The c/d roadway connects the North South Freeway with Becher Street and Lapham Boulevard as the mainline advances north two miles to the Marquette Interchange with Interstate 794. Photo taken 06/13/15. The left-hand two lanes continue Interstate 43 north through the Marquette Interchange toward Whitefish Bay, Fox Point and Green Bay. Photo taken 06/13/15. A high bridge takes Interstates 43 north & 94 west over the Menomonee River and adjacent industrial areas to Exit 310C for Interstate 794 east. Photo taken 06/13/15. Interstate 794 spurs east from the Marquette Interchange to the Milwaukee Lakefront as I-94 turns west toward Miller Park and the western suburbs. Photo taken 06/13/15. The previous sign posted two miles south of the Interstate 794 referenced the left-hand ramp for the continuation of Interstate 94 west & U.S. 41 north. This movement now utilizes the highest flyover of the Marquette Interchange. Photo taken 09/02/05. Typical traffic congestion as Interstates 43 north and 94 west prepared to split at the old Marquette Interchange. Two lanes now serve the westbound continuation of I-94. Photo taken 09/02/05. A lane drop occurred at the ramp departure (Exit 310C) for Interstate 794 east. On this day, much of the traffic congestion was related to traffic continuing north on Interstate 43. Photo taken 09/02/05. The adjacent off-ramp (Exit 72C) from I-43 north was removed due to the flyover from I-794 west. A new ramp, signed as Exit 72A, departs from within the Marquette Interchange to Michigan Street now. Photo taken 09/02/05. Posted within the Stadium Interchange with Wisconsin 175 (former U.S. 41 and Wis 341), this sign formerly referenced left-hand ramps for both I-43 north and I-794 east without control points. The 2007 replacement includes exit tabs and Green Bay / Lakefront for the respective routes. Photo taken by Chris Lokken and Mike Saldivar (08/13/06). 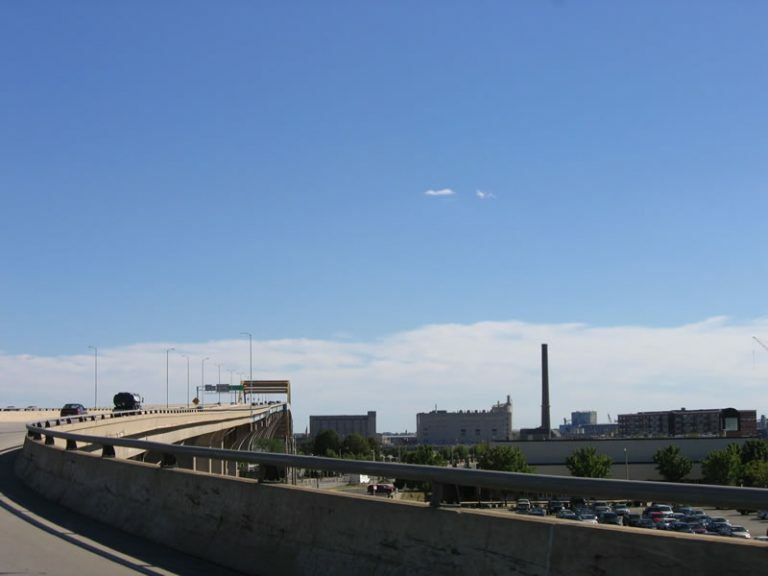 An elevated stretch of Interstate 94 parallels an industrial area along St. Paul Avenue and the Menomonee River preceding the Marquette Interchange. Note that at the time of the 2006 picture, the single lane ramp to continue on Interstate 94 east & U.S. 41 south was closed. Photo taken by Chris Lokken and Mike Saldivar (08/13/06). Signs for Exits 310B (I-43 north) and 310C, the continuation of the East West Freeway to I-794, were reused during a later stage of the Marquette Interchange project. Photo taken by Chris Lokken (09/21/07). This diagrammatic sign on outline the former lane allocations for the upcoming stack interchange with Interstates 43 and 794 east. It was removed at the onset of the Marquette Interchange project. I-794 continues the eastward push toward the Milwaukee Lakefront before turning southward to Lake Parkway (Wisconsin 794). Photo taken by Craig Holl (circa 2000). The second in a series of diagrammatic signs posted ahead of the Interstate 94 east & U.S. 41 southbound merge with Interstate 43. Photo taken by Craig Holl (circa 2000). The off-ramp to 13th Street was extended westward to depart I-94 east ahead of the 16th Street overpass. Exit 310B for I-43 north to Green Bay immediately follows the overpass now. Photo taken by Chris Lokken (09/21/07). Multiple ramp departures took place in fast succession along Interstate 94 east at the Marquette Interchange. Exit 1H quickly followed to James Lovell Street beyond the left-hand ramp (Exit 310B) for I-43 north and the 110-mile drive to Green Bay. Photo taken by Craig Holl (circa 2000). The industrial building located within the Marquette Interchange was demolished to make way for modernization of the exchange. Photo taken by Craig Holl (circa 2000). High flyovers take shape as part of the $810-million Marquette Interchange project in this scene at the new off-ramp for Interstate 94 east onto the North South Freeway. Photo taken by Chris Lokken (09/21/07). Interstate 43 (North South Freeway) drops below grade from the diamond interchange (Exit 73) with STH-145 to Downtown and the Marquette Interchange with Interstates 94 and 794. Photo taken 05/30/11. Removal of the Park Freeway interchange shifted the roadways of Interstate 43 inward to the Highland Avenue overpass. Three lanes continue to the merge with Interstate 94 east toward General Mitchell International Airport (MKE), Chicago and Beloit. Photo taken 05/30/11. An auxiliary lane joins I-43 south from STH-145 (Fond du Lac Avenue) to Exit 72D for I-94 west. 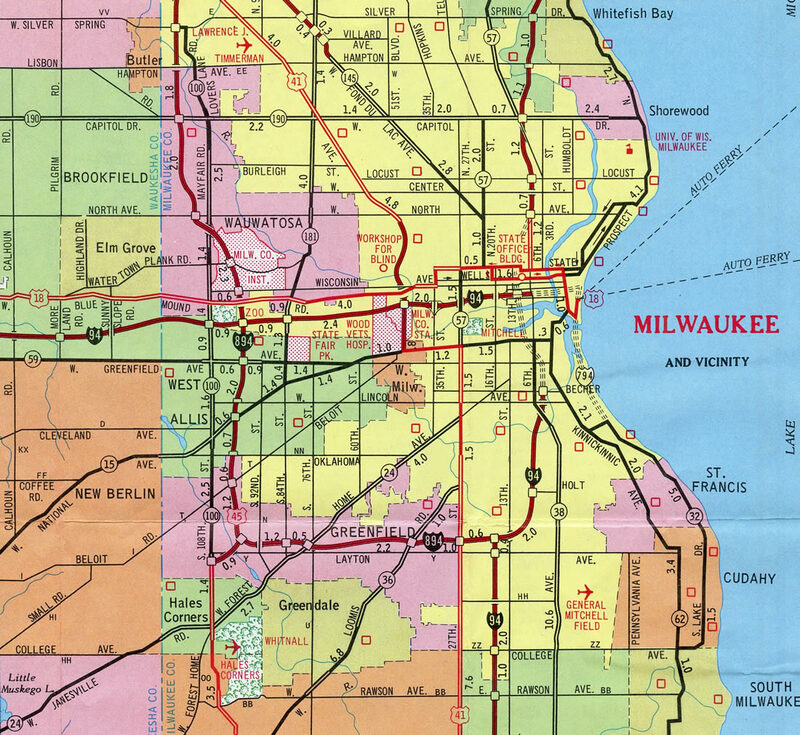 I-94 travels the East West Freeway across Milwaukee to Elm Grove and Brookfield. I-794 extends the freeway east to the Lake Freeway south. Photo taken 05/30/11. A two lane ramp shuttles motorists through a tunnel from I-43 south onto I-94 west at Exit 72D. A single lane flyover (Exit 72B) follows for Interstate 794 east across the south side of Downtown to Lakeshore State Park. Photo taken 05/30/11. Drivers taking Exit 72B see two ramps for the Milwaukee central business district before I-794 turns south onto the Hoan Bridge to the Port of Milwaukee. Photo taken 05/30/11. Lowering from the Hoan Bridge, I-794 approaches the folded diamond interchange (Exit 3) with Carferry Drive. The forthcoming exit serves both the Port of Milwaukee and the Lake Express high speed ferry across Lake Michigan to Muskegon, Michigan. Photo taken by Peter Johnson (02/07/16). Interstate 794 lines the east side of Jones Island to Exit 3 and the transition to STH-794 (Lake Parkway). Photo taken by Peter Johnson (02/07/16). A new end sign assembly for I-794 was posted at the completion of the Hoan Bridge Project in 2015. Photo taken by Peter Johnson (02/07/16). Exit 3 departs I-794 south for Carferry Road and Lincoln Avenue to the Bay View community. Wisconsin 794 takes over and extends the route south as the four-lane Lake Parkway to the city of St. Francis. Photo taken by Peter Johnson (02/07/16). Traveling along the original deck of the Daniel Hoan Bridge south over the Port of Milwaukee. Photo taken 05/09/10. These signs were carbon copied onto a new sign bridge during the Hoan Bridge Project. Photo taken 05/09/10. This end shield was posted above the barrier median of Interstate 794 ahead of Exit 3. It was replaced with a cutout shield by 2009. Photo taken by Jeff Royston (11/06/05). The sign bridge at the off-ramp (Exit 3) for Carferry Drive was replaced during the Hoan Bridge Project. Photo taken 05/09/10. 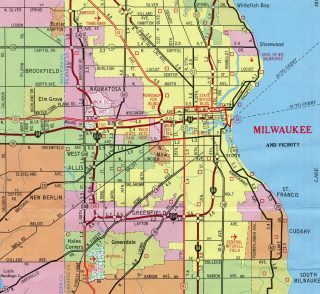 Lake Parkway (STH-794) leaves the city of St. Francis and enters the city of Milwaukee north of General Mitchell International Airport (MKE). Photo taken by Jeff Royston (11/06/05). This is the first northbound Wis 794 reassurance shield within the city of Milwaukee. Note how the route was constructed, as it is generally below grade and built on a narrow right of way. While the shoulders are substandard for an Interstate highway, the landscaped median helps give the roadway a parkway feel. Photo taken by Jeff Royston (11/06/05). Wis 794 north intersects a connector to Oklahoma Avenue at grade before continuing toward the Port of Milwaukee interchange and beginning of I-794. Photo taken by Peter Johnson (02/07/16). Wis 794 (Lake Parkway) swings northeast away from the parallel Union Pacific Railroad to reach the loop ramp (Exit 3) for Carferry Road. Interstate 794 takes over from here northward to Downtown Milwaukee. Photo taken by Peter Johnson (02/07/16). An end shield assembly follows for STH-794 north as the freeway ascends onto the tied arch Hoan Bridge over Jones Island. Photo taken by Peter Johnson (02/07/16). The overheads at the Carferry Drive off-ramp on STH-794 (Lake Parkway) north were replaced as part of the Hoan Bridge Project. Photo taken 08/12/09. Wisconsin Highways: Highways 400-894 (Chris Bessert). “Parkway ‘fulfills’ Bay View dream.” Milwaukee Journal Sentinel, October 3, 1999. “Good news, bad news on new parkway.” Milwaukee Journal Sentinel, October 5, 1999. “Lake Parkway south-side link fulfills a long-held dream.” Milwaukee Journal Sentinel, June 21, 1999. “Lake Parkway to open to traffic today.” Milwaukee Journal Sentinel, October 1, 1999. 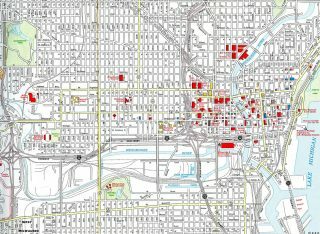 “Deal creates different fates for freeways – Norquist, others wanted Park East spur and I-794 to fall, but latter stretch stays.” Milwaukee Journal Sentinel, May 3, 1999. “Regional planners approve Lake Parkway extension” Milwaukee Business Journal, December 6, 2012. “‘Gorgeous new addition:’ WisDOT celebrates opening of the Lakefront Gateway Project.” Fox6 (Milwaukee, WI), June 13, 2017.